In 1935, Nuffield sold the MG Car Company to Morris Motors and it was this rationalisation that lost MG its autonomy. Cecil Kimber was instructed that Abingdon was to return far higher profits and as a result the racing programme ceased with immediate effect. He was also informed that production of the Wolseley based overhead cam engines was to stop as part of the rationalisation programme which meant that building of the PA/PB and Magnette models would end. Probably the biggest shock to him would be that the MG design office was to close with all design work transferred to Cowley. The new management was solely interested in profitability related to simplicity and uniformity of parts and it was amongst many harassing restrictions that the new Midget evolved in the latter half of 1935. This new car was the first of the T series and the TA, as it was to become known, was not a car that Kimber and the workforce initially enthused about, their loss of independence and the loss of the very popular overhead cam engines causing much heartache. 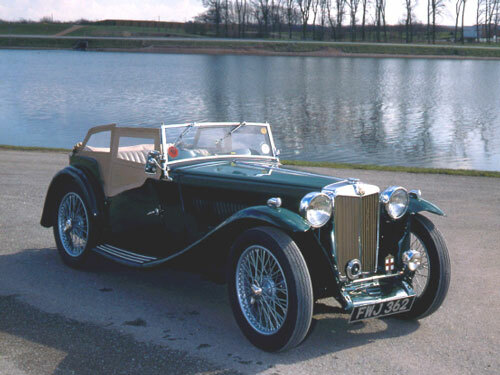 The TA was to be the first of a line of T series MG cars that spanned two eras of pre- and postwar motoring. There were to be five models in all; TA, TB, TC, TD and TF and they were the last of the traditional MG sports cars. Announced in 1936 the MG TA Midget heralded cries of anguish from the purists who resented the fact that the overhead cam engine was to give way to a Morris 10 derived, overhead valve pushrod engine. The new TA was longer and wider than its predecessor, the P type Midget, the car was also much more comfortable and roomier and had the luxury of hydraulic brakes, It was also very competitively priced at £222 and represented very good value for money. The quality and straightforward design soon won over the stalwart overhead camshaft brigade as the TA had kept all the most desirable features and the larger engine provided much more pulling power throughout the range. This ensured that the car held its own in competition and the roomier body and improved and more comprehensive weather equipment made the car altogether a more exciting prospect for touring. A traditional chassis was employed and although new, was of the familiar Abingdon design. The car was 8.5" longer than its predecessor the PB, which allowed more room in the passenger compartment, and the wheelbase was now 7'10" as opposed to the 7'3" of the PB. The main side members looked essentially straight from both elevations apart from the swept front end to clear the axle. Cross bracing was effected by four tubular steel sections and like its predecessors the chassis under slung the rear axle. At the front the chassis section between the new rubber engine mountings and the gearbox braces was boxed in. This had the effect of stiffening the side members where the torsional stresses were at their greatest because the rubber mounted engine now provided less rigidity than in the PB. Suspension was similar to the PB with half elliptic leaf springs at the front and rear with the rear ones mounted on Silentbloc bushes and sliding trunnions. The PB used friction damping at the front and hydraulic lever arm damping at the rear, but the TA was to use Luvax lever arm dampers all round. Cam gear steering was retained but a new feature was the fitting of Lockheed hydraulic brakes. The drums were considerably smaller than those on the PB and were reduced from 12" to 9" and the fly-off type handbrake was to be retained as a standard feature. Spindly 19" outsidelaced wire wheels shod with 4.50 section tyres had centre lock fixings. The two seater body was of traditional construction built on an ash wooden frame, secured to the chassis rails by 10 bolts. P type rear wings were employed and a vertical slat radiator replaced the earlier honeycombe type. A slab type 15 gallon fuel tank and spare wheel carrier adorned the rear end. The tank had a three gallon reserve compartment and this was operated by a dual petrol line from the tank leading to a dashboard mounted valve switch. The new Midgets' engine performed well in comparison to the earlier overhead cam engines that needed plenty of hard revving to gain the performance. The MPJG engine as it was coded used a 102mm stroke and a small bore of 63.5mm with a displacement of 1292cc derived from the Morris 10 engine. The horsepower rating was 10, which was all important for motor taxation and pricing in those days and engines with long stroke and small bore could attain reasonable power and performance without a rating penalty. Due to the Nuffield rationalisation plans all engines were produced from their Coventry engine factory with MG being built alongside Wolseley and Morris variants. The MPJG was rated variously between 45 and 50bhp at 4800rpm and had the benefit of twin SU carburettors, improved manifolding and camshaft. The power was fairly well down in the rev range, which when combined with the weighty flywheel and fairly high back axle ratio meant that the car would cruise comfortably without the drama associated with the high revving P types. The engine did have some rather innovative features with a belt driven cooling fan and pump together with a thermostat, instead of the dated thermosyphon method of cooling. The engine also consumed its own fumes to a limited degree with a pipe breather into the air cleaners from the valve cover and there was also a pipe from the crankcase that vented into the airstream under the car. The TA was certainly a lot cleaner and less pungent with fumes than its predecessors. The engine compartment consisted of a long flat centre-hinged bonnet and each half of the bonnet had a louvered side panel that itself was hinged to the top panel. This hinging arrangement allowed the panels to fold against each other and gave good access to the engine. On the nearside there was a 'power bulge' in the side panel to accommodate the dynamo. Tool boxes were thoughtfully built onto the bulkhead in true sporting tradition and twin six volt batteries were mounted beneath the rear luggage floor that was removable for access to the batteries and rear axle. The water pump and associated 12" cooling fan were driven by a belt that also ran the dynamo which was mounted in a horizontal position alongside the engine rather than vertically mounted at the front of the engine as on the overhead camshaft cars. Other benefits included coil ignition, a distributor and 14mm sparking plugs and a welcome thought was the fitting of the oil filler cap into the top of the rocker box cover instead of deep inside the engine compartment. A huge 11 pint aluminium ribbed sump aided engine cooling and also contained a floating suction pump that rode on the surface of the oil thus avoiding the sludge that invariably built up in the bottom of the sump. The choice of gearbox was limited with the PB and Magnette boxes due to be phased out at the same time as the overhead camshaft engines. There was only the Nuffield gearbox that was normally mated to the 102mm stroke engine to choose from. This meant that a cork faced clutch running in oil had to be utilised and this transferred the power via a non-synchromesh 4 speed box and high ratio bevel gear rear axle to the road wheels. The lack of synchromesh was no great disadvantage, as no previous MG had ever been fitted with it, but at a later stage TAs were to be fitted with synchromesh on third and top gear. A remote control gear change was developed and close ratio gears were employed. This Midget was probably the most civilised so far with the interior appointments good and designed with a degree of comfort in mind. The wider body gave the occupants more elbow room and the seats had separate cushions with a common back rest that was adjustable for rake. The hood and sidescreens were quite civilised with mica celluloid windows and the folding front screen was fitted with Triplex safety glass, quite a luxury for such a moderately priced car. The dashboard was symetrically pleasing with large 5" speedometer and matching rev counter which carried an eight day electric clock and there was a central cluster with switches and ammeter etc neatly mounted. All the instruments were illuminated from the rear which proved very handy for night rallying and there was a map readihg light on the passenger side of the dash with 30mph warning light looking very similar to the map light mounted in front of the driver. The spoked steering wheel was adjustable for rake and to complete the package, both driver and passenger had map pockets and outside door handles. The TA was only available as a two-seater, unlike many of its predecessors and the car remained virtually unchanged throughout its production life. 3,003 cars were produced and they were almost identical apart from a few notable exceptions. They were the competition cars known as the 'Cream Crackers' that were featured in a previous article and of course the delightful and rare Tickford drophead coupe together with the beautiful Airline fixed head coupe. Despite early misgivings about the TA, the car was a success story and sold well with little or no effective competition from such companies as Singer and Riley. The TA gave way to the TB which was launched in May 1939 and sported an all new engine which was to become renowned and designated XPAG. Valve operation: overhead valve operated by pushrod and rockers. Carburation: twin semi downdraught SUs. Power output: approx 50bhp @ 4,500rpm. Clutch & Gearbox: wet cork, manual 4 speed non-synchro gearbox (early cars) 4 speed part synchro (late cars). Rear Axle: Spiral bevel gears. Suspension: Beam front axle with half elliptic springs and Luvax hydraulic lever arm dampers. Live rear axle, with half elliptic springs and Luvax hydraulic lever arm dampers. Tyres: 4.50-19" on 2.5" rims. Brakes: Lockheed hydraulic 9" drum front and rear. Track: 3' 9" front and rear . Number produced: (standard TA) 3003 between 1936 and 1939. Basic price new of standard TA: £222. Tickford Coupe: £269. Max speed: 79mph. 0-50mph: 15.4 secs. Standing quarter mile: 22.8 secs.